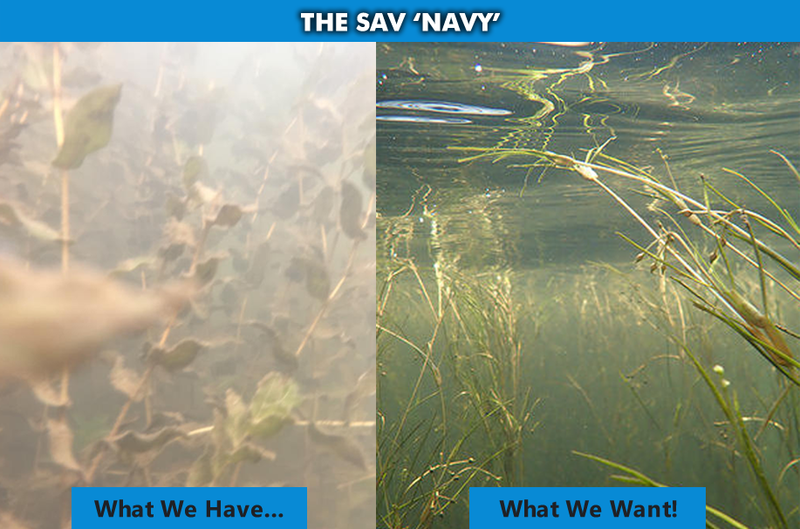 We need citizen scientist volunteers to help us map and identify the return of our underwater grasses, the fabled submerged aquatic vegetation (SAV) in the Severn River. Your help is needed to better understand the reasons our grasses disappeared in the 1980s and to help promote solutions that encourage their rebound today. A bit of history: Just a generation or two ago, the Severn River enjoyed a bountiful crop of underwater grasses. These grasses were so plentiful that swimmers, boaters and fishermen viewed underwater grasses as a nuisance, even a hazard to navigation. But the once-abundant SAV back then were providing vital habitat for fish and crabs. Catching a ‘mess o’ crabs’ for a crab feast was an easy afternoon’s work. Plus, these underwater grasses also helped filter and clean the river and they absorbed storm and wave energy to protect shorelines from erosion. In the 1980s, our grasses vanished due pollution caused by rapid development. With the lost of SAV habitat, fish and crab stocks declined. How can we reverse this trend? This is where you can help. The Severn River Association is recruiting volunteers to serve in our famous SAV ‘Navy’ of kayak-based citizen scientists. Join sign up, email TAGuay@severnriver.org. Their assignment is to search for areas where the grasses are rebounding, identify which species of grasses are growing,measure clarity in the area and map these locations with latitude and longitude readings where the SAV has returned. Thanks to a grant from the Maryland Department of Natural Resources and the Chesapeake Bay Program, SRA has purchased monitoring equipment our team of volunteer citizen scientists use to identify and monitor the underwater grasses. Our volunteers kayak the shallows to ground truth aerial surveys of SAV in the Severn River provided by the Virginia Institute of Marine Sciences. The volunteers also use hand-held hiking GPS trackers to pinpoint the grass beds and post the locations on charts. The charts enable the kayak teams to return to the same beds every year and monitor progress. Filter murky river water to create plumes of clear water, which is vital for the spread of more SAV because underwater grasses are like every other plant, they need sunlight to thrive. With your support, we can continue to monitor and restore our SAV beds so they can provide habitat for fish and crabs, filter the water and protect our shorelines. The Severn River Association, Chesapeake Bay Program, Maryland Department of Natural Resources and the Virginia Institute of Marine Sciences. Enhance underwater grass-related education and outreach.